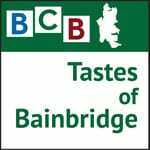 Here’s the first episode of our newest podcast radio show: “Tastes of Bainbridge” — a series discussing local foods, farming, gardening, recipes, cooking and dining in this community. 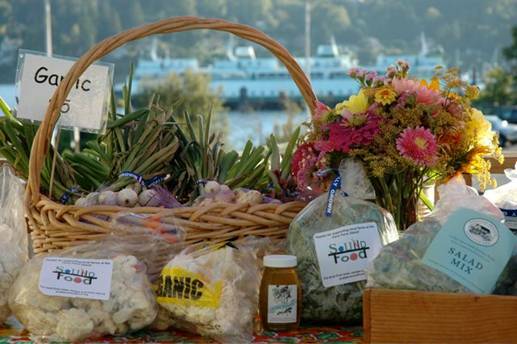 Sustainable Bainbridge periodically publishes a Sound Food eNewsletter with recipes using local ingredients, plus the latest news on what’s fresh and what farms, businesses and restaurants are serving up local food. Sound Food began in 2007 with a Sustainable Bainbridge farm-mapping project designed to answer the question: “How do I find local food in this community?” An updated version of the resulting interactive online map can still be found on the Sound Food website. In this podcast episode, two co-founders of Sound Food – Sallie Maron and Carolyn Goodwin – discuss the various past and current activities of Sound Food. They’re all about connecting local residents to local food. In this episode, Sallie and Carolyn describe the great success of the Sound Food “Ferry Farm Stand”. It greeted commuters weekly. In this podcast episode, Sallie and Carolyn describe the innovative ideas that have been introduced by Sound Food over the years — such as the ferry terminal farm stand, which was a big hit. Over the years, Sound Food organizers found their vision expanding to include the whole food system including production, processing, distribution, consumption and waste/compost. This logo is awarded by Sound Food to restaurants and stores that include local foods in their offerings. Sallie and Carolyn note that Sound Food and the BARN are collaborating on the goal of forming a BARN Kitchen Arts group. In late July, the first session of that new activity attracted about 20 people, who had fun making spring rolls from local ingredients. The next two evening sessions will be August 28 and September 25th at the Rolling Bay Center. Find out more at the BARN’s website. Sallie and Carolyn emphasize that a lot of talented people have helped Sound Food and contributed to the organization’s success. They express gratitude for friendships that have blossomed and experiences and expertise that have been shared by many volunteers who brought energy and ideas to Sound Food. 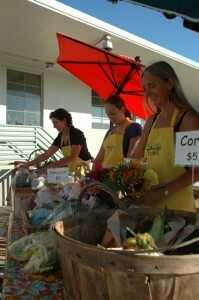 Volunteers helped make Sound Food’s Ferry Farm Stand project a success. You can access more information and sign up for the Sound Food eNewsletter at the very bottom of their web homepage. Speaking of local food, save the date for this year’s Harvest Fair! Sound Food is organizing a Farmstand as part of the annual Harvest Fair at the Johnson Farm on Saturday September 28. Credits: BCB host and editor: Barry Peters; Intro music: Tim Bird; Ferry music: Dogfish Bay Studios; Podcast art: artopia creative.